I hope these six blogs on living your dash have inspired you not to be content with a mediocre life – after all, we are all allocated a life in which to leave a meaningful legacy, and that time is precious. Consider, if you are currently 60 years old, and expect to live another 20 years, you have 240 months left. How valuable was your time spent in the last month? Keep an eye out for my next series on the theme of living your dash. Feel free to borrow my book from the Chartered library or to order it from me by contacting me via www.eplway.co.za. Seven-Step Change and Resilience model. There is a useful grid in the book to assist you in this exercise. For the purposes of this blog, you may just find the steps useful in provoking thought. Step 1: Become aware of the issue/problem – this is always the first step of change. Lack of awareness equals lack of change. Step 2: Acknowledge the impact on your life. Step 3: Consider your intent, your desire or will to change – what is the why, the motivation? Step 4: What are your options to improve your situation? Step 6: Take action and persevere: identify action steps and timelines. Reward yourself. Regular Stock Control – is it working for you? This blog is designed to help you clarify your values. 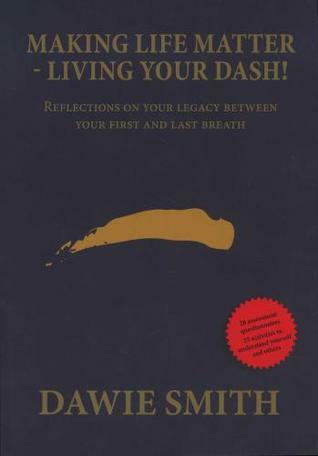 A more comprehensive list can be found in the book, Making your life matter – living your dash. Write down you own values and assess the extent to which you live these values effectively. If there are changes you want to make, watch for the next blog in a fortnight: it will give you a useful model for sustainable change. You have 168 hours per week. How do you spend them? If you work officially, how many hours are allocated to your job each week? Now, include driving time to and from work. Any work from home – how many hours? Average total number of hours of sleep? Is there a healthy balance between your work and home life? Are you using your free time according to your values? If you are unsure about your values, my next blog offers a detailed process to help you clarify what is important to you. Consider the possibility of rescripting your dash. Do you really live according to that which is important to you? Are you happy? Generally, I see myself as a happy person. I experience my life as having purpose, being worthwhile. I experience good, enriching relationships. I have enough energy and vitality for each day. I live with peace and joy in my heart. I am and feel healthy. I am a pleasant, friendly person. I experience my daily tasks or my work as enriching and pleasant. I maintain a good standard of living and am financially stable. I feel confident about my future. Are you satisfied with your percentage? Whether you are or not, determine what the reason(s) for your score are. Some people only make significant lifestyle and relationship mindshifts when they learn from their doctor that they only have a few months to live. The rest of us often live as if we have eternity at our disposal to rectify things in our lives and relationships. We have no control over what our starting and ending dates are, but each of us has some influence in determining the quality of the dash between our dates of birth and death. Stephen Covey identifies certain fundamental psychological needs to be met for humans to experience quality of life: the four Ls. Each of these is essential and equally important. How do you live your dash? The next blog deals with this probing question. Authenticity is the first life force of a fulfilling relationship. It means to act in a genuine, sincere way, to be worthy of acceptance, to be trustworthy and to be who you really are. The word authenticity is derived from the Latin authenticus, and the Greek authentikos, meaning worthy of acceptance, trustworthy, not false, conforming to the original. There is a beautiful story of a request made by a wife to her husband. She and a group of women were involved in a personal growth programme. She asked her husband to list six things she could do to be a better wife. The husband was surprised by the request but told his wife he would get back to her in the morning. The next day the wife received six roses and a note that read, “I wouldn’t change a thing.” Of course the husband could have easily listed six things he would change about her, but when she greeted him at the door that afternoon in tears, he was happy that he hadn’t criticized her as she requested. To be able to accept and trust another person, that person must act with integrity. Acceptance breeds authenticity; when you feel accepted, you can afford to open up, to blossom, to become who you really are. Do you accept each other? Do you acknowledge and encourage each other? Do you listen to each when communicating? Are you both courteous, showing small acts of kindness toward one another? Do you both voluntarily contact each other regularly? Be sure to be honest about yourself when asking these questions. In each of us a shadow side exists and it is usually awakened and seen most clearly when we are faced with life’s challenges. Emotional pain, sadness, feelings of meaninglessness, relationship problems, financial worries, job burnout and insufficient sleep are some of the challenges that can unveil our shadow sides. These experiences in life exacerbate negative energy, spiritual dissonance and emotional vulnerability, and ultimately lead to the projection of our shadow qualities into our thoughts, feelings or behaviour. Remember the saying: your strengths may potentially become your weaknesses. Someone who is demanding and exacting, for example, may be a painful perfectionist when their shadow side is awakened. A talkative person may become a babble mouth. A naturally skeptical person could turn to excessive fault finding, and those who tend toward negative thinking are more susceptible to bouts of depression. The trick with the Bad Wolf is being conscious of how it plays out in your life. Simple awareness shines a light on the shadow and allows us to observe how it affects our relationship with others, and our lives in general. A good way to pinpoint your shadow qualities is to observe those things that irritate you most about other people. Those are invariably qualities that exist within you too. Relationships between men and women are influenced by many things, but most fundamental, on a strictly physiological level, are the chemicals in our body called hormones. Our hormones are crucial to the functioning of the human body. They play a role in our physical growth, hunger cravings, our moods, activating our immune system, metabolism, fighting and fleeing, love, reproduction and sexual arousal, parenting instincts, menopause and much more. For men, testosterone is the big player, especially between the ages of 15 and 50. Women are largely governed by oestrogen, progesterone and oxytocin which affects them in significant ways between the ages of 12 and 50 (approximately). Testosterone is dominant in males and is 15 to 20 times stronger in teenage boys than in girls. It has a stimulating influence on self-confidence, assertiveness, self-sufficiency and aggression, spatial orientation (the ability to find direction or to park a car), mathematical abilities and concentration. Oestrogen is the female hormone that gives women the feeling of calmness, pleasure and general wellbeing, and their knack for communication. It also improves memory which explains why women after menopause experience ‘fogginess’. When a woman gives birth to her first baby her hair becomes darker because her oestrogen level gradually drops with the birth of each child. Progesterone is the hormone that triggers the motherly, nurturing instinct in women. Oxytocin in women is sometimes called the “tend and befriend” hormone. It’s what gives women the urge to reach out to people and to support them. Having looked at the effect of each of these dominant hormones, it’s easy to understand the fundamental behavioural differences between men and women. However, as we age, the levels of these hormones in our bodies change, and so too then does our behaviour. When a woman reaches menopause at approximately 50 years of age, she goes through a range of physical, psychological, and emotional changes that can be attributed to the hormonal changes taking place in her body. The gradual loss of oestrogen means an increase in testosterone. This increase makes the woman more assertive, an asset which often becomes valuable should the woman, for example, lose her husband and needs to cope on her own. Unfortunately, this new asset also sometimes brings more stress, impatience and aggression along with it. Men in their transitional years often experience an identity crisis. Many start to lose their hair, their muscles atrophy and the level of testosterone in their bodies decreases. Many men lose their assertiveness and become more sensitive. A loss in libido is also frequently reported. How do hormonal changes affect relationships? When men go through “man-opause”, they become more accommodating and tender which for their partner may be a welcome change. But coupled with the harsh transition into retirement, they could experience feelings of powerlessness. This often leads to the grumpy old men syndrome. This may manifest in neediness and attention-seeking tendencies. At this time of a man’s life it would be helpful for his partner to be sensitive and attentive and to show him as much support as he needs. It will also be hugely helpful for him to redirect his energies to productive and fulfilling activities that can replace the purpose that work brought to his life. The male libido may also decline. Sensitivity from his partner is once again crucial. And medical or therapeutic intervention may be necessary. During menopause women begin to show signs of memory loss which might be irritating to her partner. But then again, men’s memory also gradually declines. Women often become more assertive which is a necessary development as the levels of testosterone in her husband decline. A women’s libido tends to increase as she gets older, so it will be essential that her partner finds ways to keep up. And because her nurturing qualities may start dissipate; she’ll have to make a concerted effort to be sensitive to her husbands need for support. There is a definite shift in roles in relationships as we age. It is not only trying for you personally – on a physical and emotional level – but it will be trying for you as a couple as well. Communication and patience during these transitionary periods is so vital. And don’t be nervous to seek help either. Inner hardiness, also called resilience, can be defined as an individual’s ability to cope with or withstand the pressures, adversity and stresses of life. It also refers to the ability to bounce back from a negative or traumatic experience. Some people, by nature, are more resilient than others. 1. Physical hardiness: The resistance of your body and immune system to neutralise bacteria, infections or diseases. 2. Emotional resilience: Your level of (in)vulnerability towards emotional challenges. 3. Mental toughness: The power of your mind (mind-over-matter) to take up a challenge and to commit to see it through. develop your ability to deal with the three manifestations of hardiness. Commitment indicates a drive to succeed in life. It can, for example, find expression in dedication to your family, work and other important priorities or values in your life. Control refers to the ability to hold one’s own when faced with a challenge, or the gift to maintain inner control in the face of adversity or pressures. Challenge refers to the ability to perceive challenges or problems as an opportunity. A healthy, resilient person can face challenges with confidence, self-determination and assertiveness. Developing resilience means developing a sense of control – of recognising that you are ultimately the one in charge of what happens to you. 1. Avoid seeing crises or stressful events as unbearable problems. Approach them as a challenge you want to overcome to prove your inner strength. 2. Accept circumstances that cannot be changed.